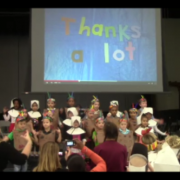 On Tuesday, November 25th, Kindergarten had their annual Thanksgiving feast and performance. Thank you so much to the teachers and assistants for preparing our students and to volunteers for helping with the feast. Enjoy the video on Youtube! Two representatives from the Rotary Club, Mr. Richardson and Mr. Johnson, came to Stonehouse on November 18, 2014. 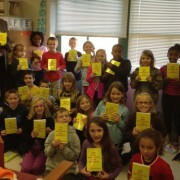 They were here to deliver dictionaries to all of our third grade students. The students were so excited to receive this present from our local organization.